I have the habit to, whenever I'm walking on the street and I happen to notice what seems like a nice place, write it down (name, location, food type and size of the venue) so that whenever I'm around again and wonder where to eat, I have a list to choose from! This has proven quite handy as this is exactly how we decided on Pomme last Sunday. 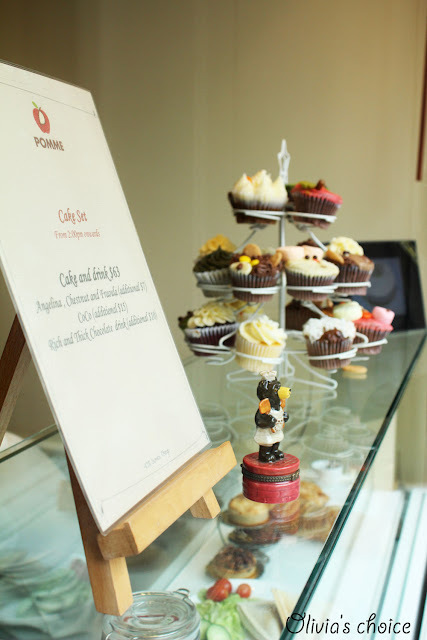 Pomme is a tiny and cute cafe with a capacity for 20 people. They serve all sorts of tarts, cakes, cupcakes and cookies, all in a very cozy ambience. 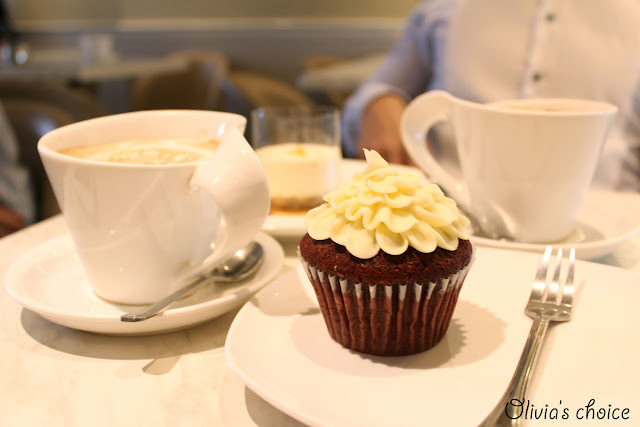 I was not really feeling hungry after all that dim sum we had for lunch, but as soon as I stepped into Pomme and my eyes landed on the Red Velvet Cupcake, I knew I had to have it. 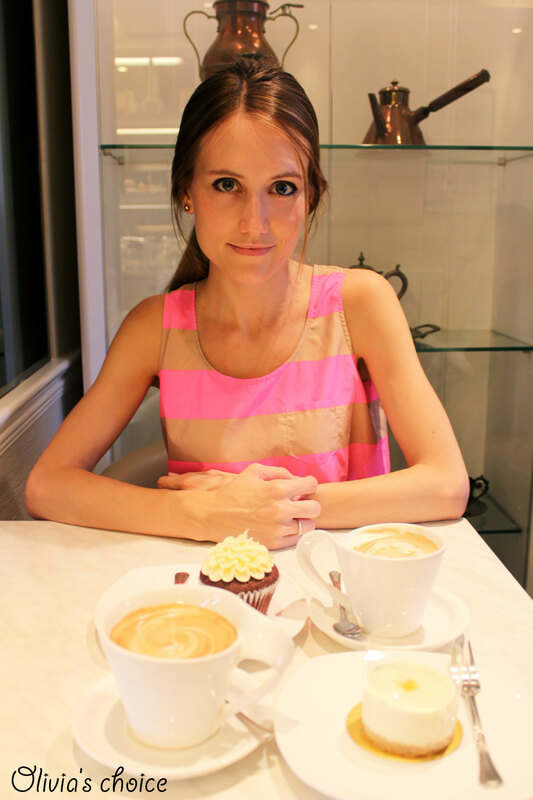 You should know that I'm totally crazy about Red Velvet Cupcakes. They are my all-time favorites, and if I go to a place where they have it, it's hard for me to choose any other sweet over this one. Besides, I like to rank them and see which venue offers the best one, so that I make sure to go back. At HK$63 + 10% charge, Pomme has a "Cake Set" from 2pm onwards including a cake and drink of your choice (The Cake Set represents a $5 in your bill, since a cake and drink without set = $35 + $33 respectively). 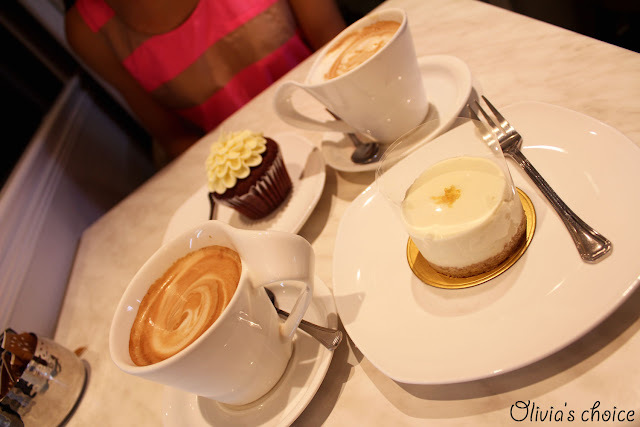 Both Jeff and I went for it, and we had lattes (4*) which he decided to accompany with the lemon cheesecake. 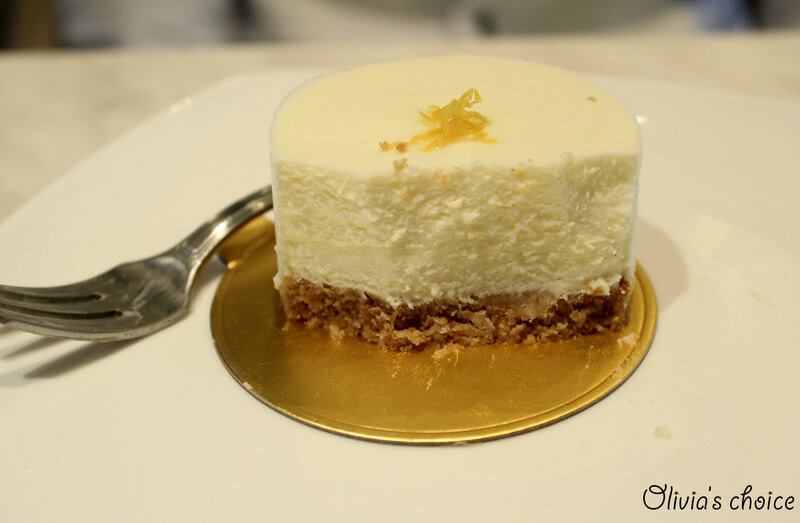 It was a French cheesecake with a crumbly biscuit base, which was not very appealing to me, since I am a fan of the much richer, thick and dense New York cheesecake. This being said, for a French cheesecake I must admit the quality was very good (4.5*). Would I recommend it? 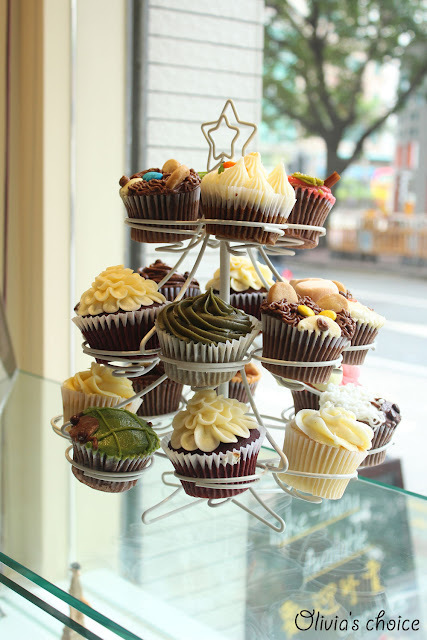 Definitely, do not miss the chance to visit Pomme when in Wan Chai! Thanks for sharing these mouth watering delicacies!